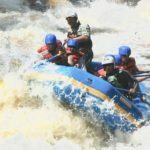 Kayaking, Lifestyle, story telling, whitewater | DBP MAGAZINE ONLINE The World's Best Free Whitewater Publication. New edition of the classic freestyle manual now available in English! Reviewed by Editor-in-Chief Chicago Mike Toughill just in time for the Holidays! Feliz Navidad! 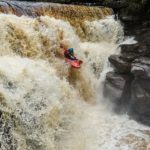 Queen of New York co-champ Genevieve Royer sits down with Staff Writer Jay Carpenter to discuss kayaking and racing the challenging rivers of Quebec and the eastern US. Ever missed your roll back in the early days and thought... "I QUIT!" Maybe that was 15 years ago, maybe that was yesterday!! Lauralyn Chrisley discusses the trials and tribulations of learning paddling skills and her method of learning. Where is the line, when it comes to Wallace and major consequences? Aaron Kendall explores the subject in depth... LITERALLY!